Santa Fe is one of the most beautiful and sophisticated small cities in the United States. It hosts more than two hundred and fifty art galleries. Santa fe is home to a world class opera house, an acclaimed symphony, The Lensic Performing Arts Center, over twenty incredible museums, Spanish Market, Indian Market, and The International Folk Art Market. There are a plenitude of cafes, amazing restaurants, spas, and churches to take-in and explore. From Santa Fe you can visit ancient petroglyph sites, Indian Pueblos, natural hot springs, and prehistoric cliff dwellings. If you love the outdoors and want to embark on an adventure filled with skiing, white-water rafting, hiking, rock climbing, mountain biking, golfing, biking, or horseback riding- it’s all just a short drive away from The Santa Fe Motel and Inn. In 2005, Santa Fe, New Mexico, was honored as one of UNESCO’s Creative Cities, the only North American city to be so designated and the only one in this prestigious international network to be recognized in two fields: folk art and design. Santa Fe is chalk full of museums and galleries. During the summer months, there are art openings and receptions held throughout the city every Friday night from 5PM to 7PM. There are three different art districts in Santa Fe. The Santa Fe Railyard is which is a five minute walk from The Santa Fe Motel and Inn hosts a plethora of galleries, the acclaimed SITE Santa Fe, Lewallen Gallery and Tai Gallery to name a few. Canyon Road accommodates over 100 art galleries, locally owned shops, and artist’s studios. It runs adjacent to the Santa Fe River on the East side of the city. There are several incredible galleries, artist’s studios, and museums located in the vicinity of Santa Fe’s historic downtown plaza. 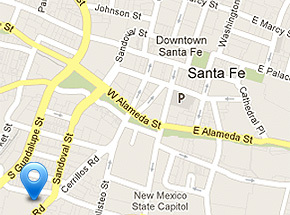 Please be sure to stop by Andrea Fisher Gallery, Shiprock Santa Fe and The Georgia O’Keeffe Museum which is located just west of the plaza on Johnson Street. You can find the most beautiful and authentic Native American jewelry and art under the portal of The Palace of the Governors- located just North of Santa Fe’s historic downtown plaza. Writers, Authors, and Poets…OH MY! Many well-known writers like D.H. Lawrence, Cormac McCarthy, Kate Braverman, Douglas Adams, Roger Zelazny, Alice Corbin Henderson, Mary Austin, Witter Bynner, Dan Flores, Paul Horgan, Rudolfo Anaya, George R. R. Martin, Mitch Cullin, Evan S. Connell, Richard Bradford, John Masters, Jack Schaefer, Michael Tobias, Susan Gardner, Hampton Sides and Michael McGarrity have all made Santa Fe their home. The Santa Fe Opera season begins in late June and ends in late August each year. The city also hosts the Santa Fe Chamber Music Festival which happens every summer at The St. Francis Auditorium and The Lensic Performing Arts Center. The Santa Fe Desert Chorale performs at the The Loretto Chapel and Cathedral Basilica of St. Francis during the months of July and August. The Santa Fe Ballet Company partnered up with Aspen Ballet Company a few years ago to form ASPEN SANTA FE BALLET. They perform in both Santa Fe and Aspen and tour nationally and internationally. Santa Fe is also home to internationally acclaimed Flamenco dancer’s Maria Benitez Institute for Spanish Arts which offers programs and performance in Flamenco, Spanish Guitar year round. In addition, The Thirsty Ear Festival of Roots Music, The New Mexico Jazz Festival, The Santa Fe Bluegrass & Old Time Music Festival should are all happening during the summer months. Notable local musicians and bands are The Alex Mayoral Band, Robert Mirabal, Gary Farmer and The Troublemakers, Bill Hearne, NACHA MENDEZ, The Santa Fe Chiles, Trisha Parish, and Joe West and The Santa Fe Revue. The Santa Fe Band Stand, located on the historic Santa Fe Plaza is a fun venue to experience live music on summer nights.